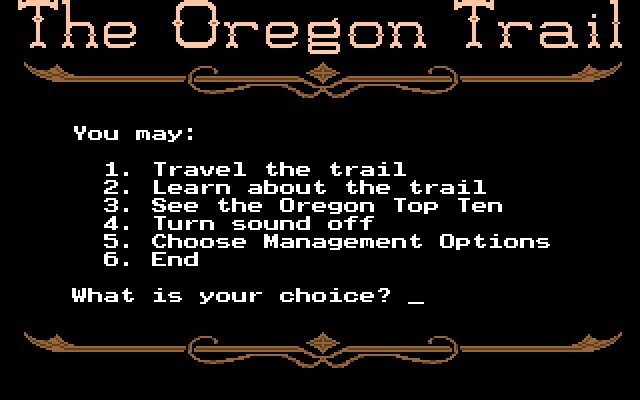 One of the favorite games of my fondly remembered childhood is a text based adventure called Oregon which was released in 1975 on a time-share mainframe setup called the Michigan Terminal System (aka MTS). I first played the game in 1977 using a teletype terminal connected to a PDP-11. It was a magical and intense experience having to hunt for survival, forage for food, and defend my settlers from Indians by typing very quickly when prompted. I was quite the weathered trailblazer when I impressed all the kids in my class with my completed printout of the journey. Although utterly primitive by today's standards, the excitement of trying to survive the Oregon trail, controlled by a hulking mysterious machine far away, was a brand-new experience to children just before the onset of the digital age. I was not alone in my fondness for the game. In 1973, a few years before the Oregon adventure was written, the Minnesota Educational Computing Consortium (aka MECC) was created and funded by the State of Minnesota. The state had the foresight to create an organization that would help schools on a statewide basis to plan for the use of computers. MECC was designed to develop educational computing programs for Minnesota school students, but also to join joint practices between K-12 an higher education. MECC ran a large, centralized timeshare that schools across the state could call into via telephone network. MECC created a central library of resources which served thousands of teletype terminals across the state. By far, one of the most popular educational tools was a game called Oregon. Put it this way: If you were a child in the 70s, and your school was one of the fortunate few with time-share computer access for its students, chances are you tried Oregon. And when the first PCs appeared in 1977 MECC began to transfer the best of their programs from the timeshare library to diskette -- all materials were programmed for the Apple. 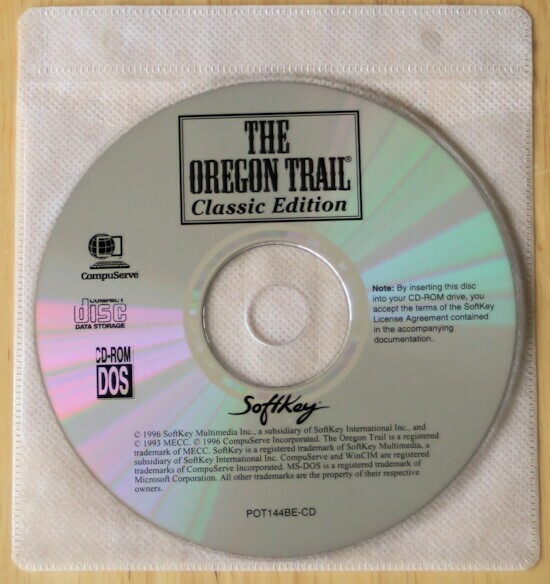 Thus was born The Oregon Trail for the Apple ][. The title was so popular that MECC began to sell its software across the country at profit and used the money to fund the educational effort in Minnesota. In the late 1980's, MECC became the Minnesota Educational Computing Corporation -- it was sold to a North American venture capitalist, for $5 million. Within one year, it was sold again to The Learning Company -- for $250 million. The MECC offices in Minnesota were closed in January 1999. As both a gamer and nostalgia nut Oregon will always be a fond memory. The MECC is no more but its spirit lives on in the form of The Oregon Trail series, which shows no sign of slowing down. Each new version adds features, makes the gameplay more intuitive, while maintaining excitement of the journey. Independence, Missouri is the starting point in The Oregon Trail. After naming your character and four travelling companions and selecting an occupation, your first task is to buy supplies based on which character types you've chosen. For example, bankers and doctors will have no difficulty buying all the items they need but will have lower scores upon completion of the game. Occupations like farmers and teachers, on the other hand, provide you with only a bare bones amount of cash but huge score multipliers at the end. If your purpose of playing The Oregon Trail is to achieve a high score, though, something has gone seriously wrong in your life. The basic goal of your party of adventurers is to successfully cross the entire western half of the United States and reach salvation (and rivers of gold, no doubt) in Oregon's Willamette Valley. Venturing out into the VGA-rendered environments of The Oregon Trail quickly reveals some lackluster project design. 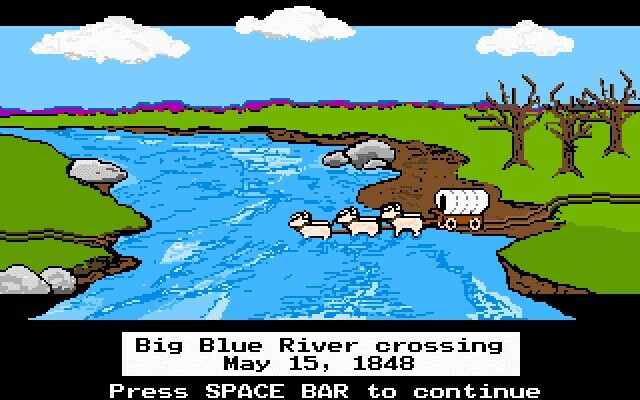 The small animation of your wagon being pulled by oxen looks as if it uses EGA graphics at best and the map of the United States is basically a digitized version of a real map. The icons to the left and right of the screen, though, are reasonably well designed and colorful. The aforementioned icons, present throughout the game, are actually help functions for hunting, trading, resting and guiding. When you talk to or trade with the locals of an area, a semi-realistic portrait of an 1800s citizen pops up (seemingly out of place here) to offer advice or horribly overcharge you for one pile of goods or another. 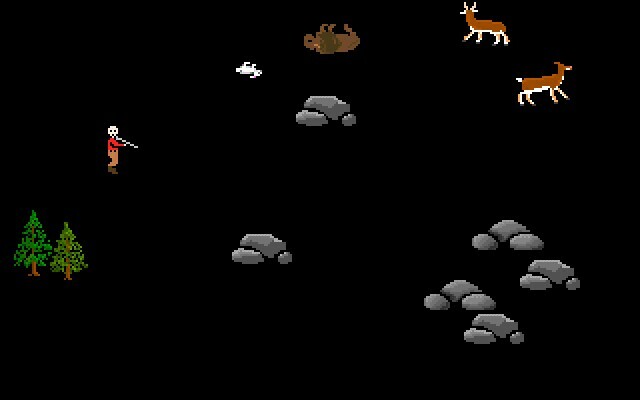 Hunting, on the other hand, initiates a short action sequence (sure to please the kids) where you mercilessly assassinate buffalo, deer and other animals you would be unlikely to encounter. Travelling by oxen cart to Oregon is not without randomized drawbacks, however. Children can potentially learn a great deal about the American West while playing but they can also learn quite a bit about random, completely senseless death. Party members get sick and die for no apparent reason, though that may be fairly realistic considering the health conditions facing most western expansionists in the 1800s. Regardless, countless setbacks are encountered along the way and most, aside from death, can be overcome by careful pre-planning or critical thinking, both important skills that children (and adults) obviously need to develop in their day-to-day non-settler lives. "Day 84: I develop dysentery and die soon afterwards." 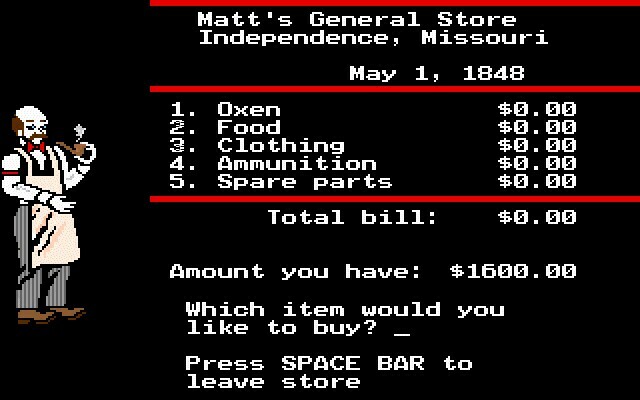 The journal note notwithstanding, The Oregon Trail is an entertaining mix of education and entertainment and utilizes an easy to understand interface. It doesn't win any awards for graphical consistency or extremely deep gameplay but is always an entertaining way to spend some time.